A disaffected ZANU-PF insider leaking details of fraud and inside information from an anonymous Facebook page has become an online sensation. But will it change anything? On 31 July, the 89-year-old Zimbabwean president, Robert Mugabe, will seek another term in a rematch of the contentious 2008 election with challenger Morgan Tsvangirai. But now, 33 years after Mugabe first took office, the icon of the African independence era is being hounded by a creation of the Internet age. 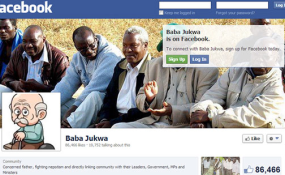 In March, a self-proclaimed disaffected insider of the ruling ZANU-PF party created the Facebook page of "Baba Jukwa". With the disarming profile picture of a cartoon old man, Baba Jukwa traffics in political napalm, spilling damaging details of high-level party meetings, allegations of voter fraud, and embarrassing gossip - all replete with private phone numbers for citizens to harass the officials in question. Most notably, Baba has warned ZANU-PF's political targets when they enter the party's crosshairs. Last month, he declared that top officials were "planning to sink Edward Chindori Chininga and replace him with their puppet". Chininga, a Member of Parliament who had released a damning report on corruption in the country's diamond mines, died nine days later in a suspicious car accident. "Heartless maggots", raged Baba Jukwa the day after. "The politics of killing each other in my party, as I always told you, will intensify... I am going to expose my party worse so that they will know that killing other people is wrong." In a country with one of the world's most restrictive press environments, Baba Jukwa has become a social media sensation. Each post garners hundreds of comments, likes, and shares, with nearly 280,000 people and counting "liking" the page. (By contrast, the pages of Mugabe and Tsvangirai have only about 100,000 "likes" each.) The state-controlled Herald newspaper has denounced the mole's "malicious motives and puerile endeavour", and President Robert Mugabe has reportedly offered a six-figure sum for his identity. It seems plausible that Baba Jukwa could indeed be a disaffected member of ZANU-PF, as the party is increasingly factionalised by internal power struggles to succeed the ailing Mugabe. Many believe the page is operated by more than one person, perhaps a cohort of ZANU-PF insiders and intelligence operatives. Still other theories suggest that the page is controlled by Tsvangirai's opposition MDC-T party, or is even a creation of American or British intelligence agencies, hoping to hasten Mugabe's departure. As the election date nears, Baba Jukwa has mounted an aggressive call for voter registration and turnout in order to oust his own party at the ballot box. "Asijiki!" ("Do not retreat!") goes his signature sign-off. But the potential impact of the political mole may be somewhat limited. While a large proportion of Zimbabweans may have some Internet access through their mobile phones, the Internet penetration rate for regular usage is low. And many of those most likely to follow Baba Jukwa - young, technologically-savvy urbanites - would already count themselves in the opposition camp. As Loughty Dube, chairman of Transparency International's chapter in Zimbabwe explains, "The majority [of Zimbabweans] on Facebook are people who already are disgruntled and know the corruption in government... the majority of voters in Zimbabwe are rural-based and they do not access the Internet". Furthermore, after decades under an authoritarian regime, much of Zimbabwe's populace is shackled by fear and mistrust. The cost of participating in political discourse, even online, was underscored in 2011 when a Zimbabwean man was arrested and jailed for a month after posting a comment supportive of the Egyptian revolution on Morgan Tsvangirai's Facebook page. Ndashaishei Ndashaishei (a pseudonym), a 35-year-old development researcher in Mutare, Zimbabwe, reads Baba Jukwa's page every day. "I cherish the many different views and comments that follow the posts", he says. But while he sometimes discusses them in private with trusted colleagues, he says that these conversations are "limited to people within your circle, people who one really knows". "You cannot do that in public places because you do not know whether the person next to you is a secret agent informer or not", he explains. "It's so frustrating that I am unable to [use my real name]", he says, noting that he had relatives in the military and ZANU-PF structures and didn't want to cause them trouble. "Besides, I might be a target when I go home next year, assuming Mugabe wins." Carlos represents one of as many as five million Zimbabweans thought to be living abroad, a group that is likely to be disproportionally active on Baba Jukwa's page due to the lessened fear of repercussions. However, the Zimbabwean diaspora has been barred by the Mugabe regime from participating in the upcoming election, despite a directive issued in February from the African Commission on Human and People's Rights. Real change will require more than just votes anyway, says Melody, a 31-year-old technology firm employee from Zimbabwe who asked to be identified only by her first name. "I do not think that Baba Jukwa has caught the imagination of the security sector, so they will not protect the win by MDC at the polls", she says. "The key is on whose side the SADC [South African Development Community] and AU [African Union] observers are. If they declare the elections free and fair after ZANU-PF has rigged the elections, there is not much MDC can do." Regardless of the short-term political implications, Baba Jukwa represents the Zimbabwean people's growing appetite for information and transparency, which will only be fuelled by increasing access to information technology. Perhaps more importantly, the page has provided many citizens with a taste of free speech, releasing a genie that will be impossible to put back in the bottle. "Baba Jukwa has given us freedom of expression, which is something that is never heard of in Zimbabwe", says Succeed Bhekizitha Dewa, a 31-year-old Zimbabwean living abroad. "He created a platform where we could discuss issues that really affect our country whilst updating us with on-the-ground with news of every dirty thing the ruling party is doing to our people." Jeffrey Smith, an Advocacy Officer at the Robert F. Kennedy Center for Justice and Human Rights in Washington, DC, concurs. "To some degree, Baba Jukwa has encouraged ordinary Zimbabweans to be a bit bolder, to be less afraid, and to voice their displeasure with the repressive ZANU-PF regime", he says. But whether the Facebook page remains a political release valve or the first wave in a sea change for Zimbabwe society depends on the populace's ability to shift their discontent from online to on the ground. "If even a slight majority of Zimbabweans actively choose change and summon the courage necessary to overcome the harassment, intimidation, and widespread repression they have routinely faced over the course of the past three decades, then nothing will stop democratic progress from taking place", notes Smith. "That will remain the bottom line in Zimbabwe, regardless of whether Baba Jukwa remains popular on social media or not." From his new home outside of Zimbabwe, Dewa holds fast to the hope of that prospect. His middle name means "Look out for enemies" in the Ndebele language, as he was born at the beginning of the "Gukurahundi" massacres in the 1980s, in which Mugabe's forces killed tens of thousands of his people. As an adult, he joined the country's security forces only to realise that "we were not serving the country's interest but only the interest of a few political elite". He escaped to a city thousands of miles away. When a friend told him about Baba Jukwa's page, he said he felt "greatly relieved" that someone had broken through the government's wall of propaganda. And he hopes that Baba Jukwa's identity will stay secret - for now. "I wish he remains anonymous as long as it takes for the good of the cause", he says. "But I would love to meet him one day in a new Zimbabwe and shake his hand for taking the bold step of becoming the voice of the voiceless." Rebecca Regan-Sachs works in international development in Washington, DC, specializing in governance and communications. She worked previously on enterprise development projects in East Africa. Copyright © 2013 ThinkAfricaPress. All rights reserved. Distributed by AllAfrica Global Media (allAfrica.com). To contact the copyright holder directly for corrections — or for permission to republish or make other authorized use of this material, click here. Burundi: Civil Society Fights Back but Will It Be Enough? Africa: Who Are You Calling Corrupt? South Africa: Miners Shot Down - Blood On Whose Hands?